HAMILTON — The Canadian Football Hall of Fame and Museum officially relaunched on Friday in a completely redesigned and refurbished 10,000 square foot space in the club level at Tim Hortons Field. A partnership between the Canadian Football League (CFL) and the City of Hamilton, the new display features steel busts of all 296 members of the Hall, state of the art digital integration, and interchangeable exhibits of artifacts dating back to the origins of our three-down game. The iconic “Touchdown Statue”, which stood outside the Hall’s old location near Hamilton City Hall for almost 50 years, has been relocated to Gate 3 on Melrose Avenue. Hamilton Mayor Fred Eisenberger praised the fact the Hall remains in the city that it has called home since 1972. 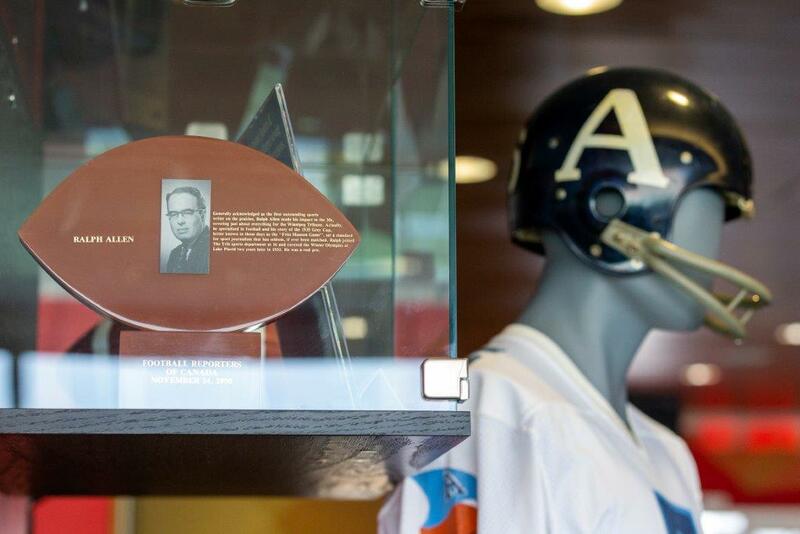 Mark DeNobile, Executive Director of the Canadian Football Hall of Fame and Museum, said the new location gives fans the opportunity to experience our history and enjoy the modern game day experience at the same time. Lawson, Mayor Eisenberger and DeNobile – joined by several Hall of Famers – presided over the opening of the Hall’s new space this evening prior to a pre-season game between the CFL’s Hamilton Tiger-Cats and Toronto Argonauts. It completes the third and final phase of a project that also includes a Grey Cup display at the stadium’s Gate 3 premium entrance and the Media Hall of Fame Wing located in the Press Box on the stadium’s top floor. The new shrine on the stadium’s club level at Tim Hortons Field will be open free to the public year-round on Wednesday evenings and Saturday mornings. All fans with a game ticket will be able to access the Hall on the club level for15 minutes following the conclusion of each CFL game at Tim Hortons Field. Tiger-Cats club level season seat holders will have access throughout the game. The CFL regular season kicks off a week earlier this year, on Thursday, June 14th, when the Winnipeg Blue Bombers host the Edmonton Eskimos at Investors Group Field. Friday Night Football debuts June 15th when the Saskatchewan Roughriders host the reigning Grey Cup champions, the Toronto Argonauts. On Saturday, June 16th, the first double-header of the season features the Hamilton Tiger-Cats in Calgary to face the Stampeders and the BC Lions hosting the Montreal Alouettes in Vancouver. For single-game tickets, click here.